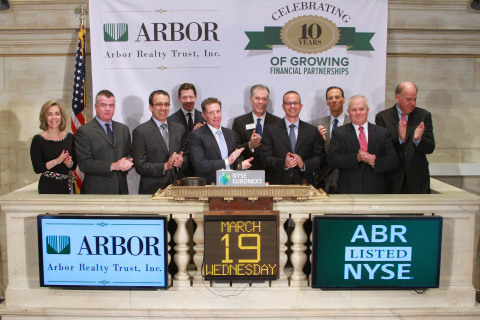 Arbor Realty Trust, Inc. (NYSE:ABR) President and Chief Executive Officer Ivan Kaufman rang the opening bell at the New York Stock Exchange today to commemorate the 10th anniversary of the company’s public listing. Kaufman was joined by his executive management team to celebrate the milestone of the commercial mortgage REIT. Arbor Realty Trust, Inc. is a real estate investment trust, which invests in a diversified portfolio of multifamily and commercial real estate related bridge and mezzanine loans, preferred equity investments, mortgage related securities and other real estate related assets. Arbor commenced operations in July of 2003 and conducts substantially all of its operations through its operating partnership, Arbor Realty Limited Partnership. Arbor is externally managed and advised by Arbor Commercial Mortgage, LLC, a national commercial real estate finance company operating through 14 offices in the U.S. that specializes in debt and equity financing for multifamily and commercial real estate. Certain items in this press release may constitute forward-looking statements within the meaning of the “safe harbor” provisions of the Private Securities Litigation Reform Act of 1995. These statements are based on management’s current expectations and beliefs and are subject to a number of trends and uncertainties that could cause actual results to differ materially from those described in the forward-looking statements. Arbor can give no assurance that its expectations will be attained. Factors that could cause actual results to differ materially from Arbor’s expectations include, but are not limited to, continued ability to source new investments, changes in interest rates and/or credit spreads, changes in the real estate markets, and other risks detailed from time to time in the Arbor’s periodic and other reports filed with the SEC. Such forward-looking statements speak only as of the date of this press release. Arbor expressly disclaims any obligation or undertaking to release publicly any updates or revisions to any forward-looking statements contained herein to reflect any change in Arbor’s expectations with regard thereto or change in events, conditions, or circumstances on which any such statement is based.